One of the reasons why we seldom buy new toys for the kids is because our relatives and friends spoil them rotten. This Magic Ball House Elephant is gifted by the little rabbit's Godfather. It came with 100 pieces colourful plastic balls. It is perfect for 9 months old babies to toddler. The super cute elephant head accessory. It is fold-able into a circular bag with zip, doesn't take up much storage space. 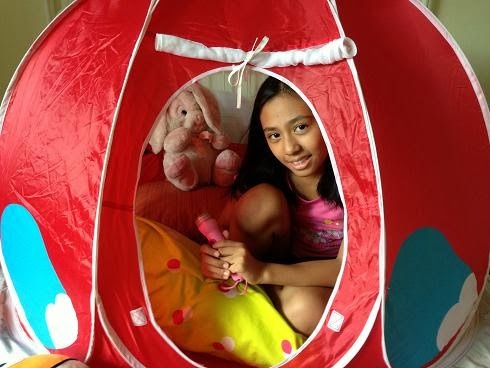 It can be converted into an indoor play tent during a rainy day. It is very spacious, my little and big rabbit can fit inside. Ventilation is good, it came with net windows.